TURKISH PM TURNS HISTORY ON ITS EAR: THE TURKS WERE VICTIMS OF ARMENIAN GENOCIDE MACHINE……. – The Tundra Tabloids……. 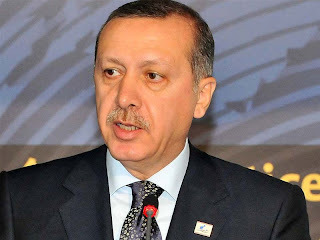 TURKISH PM TURNS HISTORY ON ITS EAR: THE TURKS WERE VICTIMS OF ARMENIAN GENOCIDE MACHINE……. many Armenians we mass murdered! The Turks are feeling the pressure, what else could explain the dizzying nonsense being spewed by the Turkish prime minister, that it was the Turks who were the vicims of genocide between 1915-1917. It’s like saying that the Jews were persecuting the Nazis during the 30’s and the 40’s. Erdogan goes on to say that “Our civilization is the civilization of love, tolerance and brotherhood”, but what he actually means is “our Islamic civilization”. It’s the same nonsense peddled by the Turk who heads the Organization of the Islamic Conference (OIC), Ekmeleddin Ihsanoglu, who told the Tundra Tabloids that “no Muslim, good or bad, could ever be anti-Semitic”…just the non-Muslim. ANKARA (RFE/RL)–Turkish Prime Minister Recep Tayyip Erdogan on Friday claimed that Armenians in the Ottoman Empire never faced genocide and, on the contrary, themselves plotted to exterminate Turks. Erdogan was reported to angrily deny the historical record of Genocide as he marked the 95th anniversary of a rare Turkish military victory during World War One. “I should underline that this country’s soldier is bigger than history and that this country’s history is as clean and clear as the sun. No country’s parliament can tarnish it,” Erdogan said, in a clear reference to U.S. and Swedish lawmakers’ latest resolutions recognizing the annihilation of 1.5 million Armenians by Ottoman Turks as genocide. Previous Post Previous Post FEMALE SAUDI WORD SMITH RILES THE CLERICS AS THE PEOPLE CHEER……. Next Post Next Post ISRAEL: WE SHALL MEET THE NEEDS OF OUR OWN PEOPLE…….